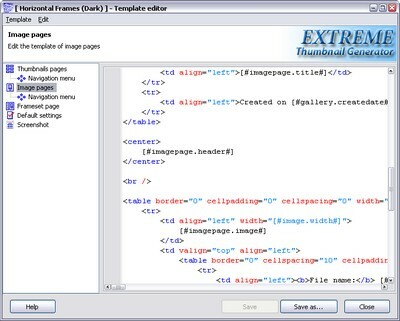 The built-in gallery template editor allows you to edit the HTML text all template files. Also you can set all default settings for your gallery here. The Thumbnails pages section allows you to edit the template of the thumbnails pages of your gallery (the thumbs_page.html file). The text of this file must have the following special tag: [#thumbspage.thumbstable#] which is replaced with the thumbnails table during the gallery generation. The Navigation menu of the Thumbnails pages section allows you to edit the template of the thumbnails page navigation menu (the thumbs_navigator.html file). The text of this file is used to replace the [#thumbspage.menubar#] special tag in the thumbs_page.html file. The Image pages section allows you to edit the template of the image pages of your gallery (the image_page.html file). The text of this file must have the following special tag: [#imagepage.image#] which is replaced with the full-szie image during the gallery generation. The Navigation menu of the Image pages section allows you to edit the template of the image page navigation menu (the image_navigator.html file). The text of this file is used to replace the [#imagepage.menubar#] special tag in the image_page.html file. The Frameset section appears only in the frame-based gallery templates. It allows you to edit the text of the framset page, which defines the size of the thumbnails page frame and the image page frame. Its text must have the following tags: [#frameset.image_frame_src#] which is replace with the relative address of the first image page in the gallery and [#frameset.thumbs_frame_src#] which is replaced with the address of the first thumbnails page. The Default settings section allows you to change the default settings for all gallery elements. The Screenshot section allows you to change the gallery preview which is used on the Gallery step. The easiest way to do it is to capture a screen using Alt + PrintScreen button and then click the Paste from clipboard button.